What is it about a city skyline that makes it amazing? Maybe it’s the tall buildings, the natural features framing the man made or something else entirely, but people seldom get tired of gazing out at a city from a distance – so much so that simply seeing the city from that point of view is a major destination and memory for travellers the world over. Add in the prominence of these great views in computer backgrounds and house art and it’s fair to say these are highly valued in our everyday lives. Of the major cities famous for their views, few can rival that of Paris. With its landmark buildings and quaint yet sprawling layout, it’s often a challenge to decide just where the best point is in the city to see the city in its entirety. Traditional wisdom has always pointed to high points within the city, which often means buildings – and Paris has some great ones to gaze out from. 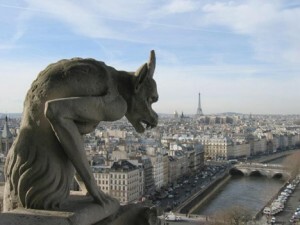 Here are just a few of the famous look out points to see what Paris has to offer as a visual delight. Some of these are free, while others will cost you a fee for entrance, like if you want Louvre tours tickets, for example – but regardless of the place, if you get that incredible feeling of seeing such a wonderful place laid out before you, it’s well worth the journey and cost. Many of these great spots are close by the fantastic Paris accommodation with Only-apartments that can be had for a spot on price in the heart of the action. What could be better than that? This is the most obvious place to look out on the city from with it being one of the tallest buildings in the world for many years and an observation deck that looks out on an incredible sight. The only down side of looking out on Paris from the Eiffel Tower is that it won’t be featured in any of your shots! High up in Montmatre resides the basilica that defies the architectural style the rest of the city seems to subscribe to. With it’s white stone and domed roof, Sacre Couer is a greaet meeting place for people of all walks of life, and a great place to just sit back and look out on the entire city sprawled out before you. The most famous church in Paris and possibly one of the most famous in all the world isn’t all that tall anymore (in comparison to more imposing structures or points in the city) but it does offer a unite vantage point from the centre of the city that can’t be matched. With this in mind, the main selling point of seeing the city from Notre Dame’s ledges is to get the gargoyles in the shot as well – how awesome is that? The least obvious place to see the city is from atop the arch at the end of the Champs D’Elysee, particularly just as the day is winding down and the whole world seems to glow. It offers a great vantage point for getting the Eiffel Tower in the shot and is just an all around great spot to see one of the best skylines in the all the world.